Bruce Willis, Samuel L. Jackson and James McAvoy return from the previous films to reprise their characters, and they all become incarcerated as the film begins. This leads to the perplexing first 70 minutes, that has all the intrinsic story value as reading the ingredients in flour. It’s not until the inevitable escape occurs that the film takes on some more electricity, and by the conclusion there is a good sense of where the mystery might go (yes, it is open ended) and some of the supporting characters step up to add there own sense of M. Night weirdness. Half a film doesn’t completely cut it, but at least the better half was in the second end. “Unbreakable” is an M. Night classic, and the sequel doesn’t move it far along enough. More on “Split’ below. The film begins three weeks after the end of “Split.” as the split personalities of Kevin (James McAvoy) are in full “Beast” mode… his super strongest part of “The Horde” (the name for his 23 inner personalities). He has kidnapped cheerleaders, interestingly enough, but is busted by David (Bruce Willis), whose invulnerability and strength was developed in “Unbreakable” … and is now “The Overseer.” In the midst of their struggle, the authorities capture both of them. They are sent to a prison institution that also houses Elijah (Samuel L. Jackson), the “Mr. 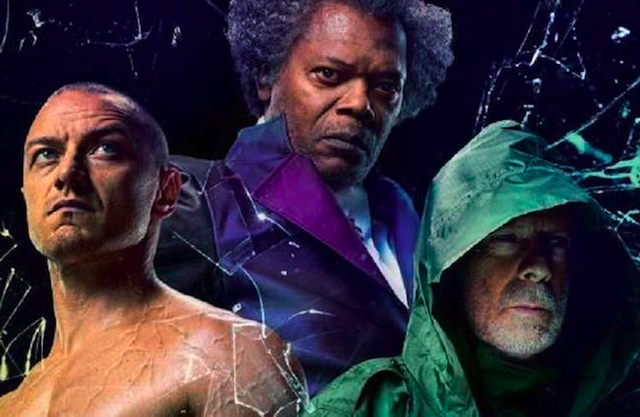 Glass” from “Unbreakable” who has a brittle bone condition, but a super-intellectual mind. A psychiatrist named Ellie (Sarah Paulson) have put the three in those walls, to convince them that their superpowers are moments of coincidence and not actual gifts. It’s up to the trio to escape to the next phase.